Some nights, I crave a tasty, fresh and quick to prepare dinner. That’s when a simple and fast sauté comes in handy. The end result always depends on what I find in the refrigerator drawer. The inclusion of onion and garlic creates a great flavor base, along with vegetables, beans, lentils and sometimes even tofu. Spices, herbs and various condiments are added to complement and perk up the dish. One of my all-time favorite meals is this simple asparagus sauté. I came across this sauté a while ago on the Cookbooks 101 blog, where Heidi Swanson posts all kinds of great recipes. For this dish I prefer to buy asparagus spears about the diameter of a pencil. Make sure they are firm to the touch, the tips are closed and the color is bright. To trim the tough bottom end, hold the spear with one hand and bend the lower end with your other hand. The fibrous part will break off easily where tender and tough meet. Then wash the spears well and cut them into bite sized pieces. If you start some rice or quinoa ahead of time, this dinner comes together in under 20 minutes. Don’t skip the Tahini Sauce! 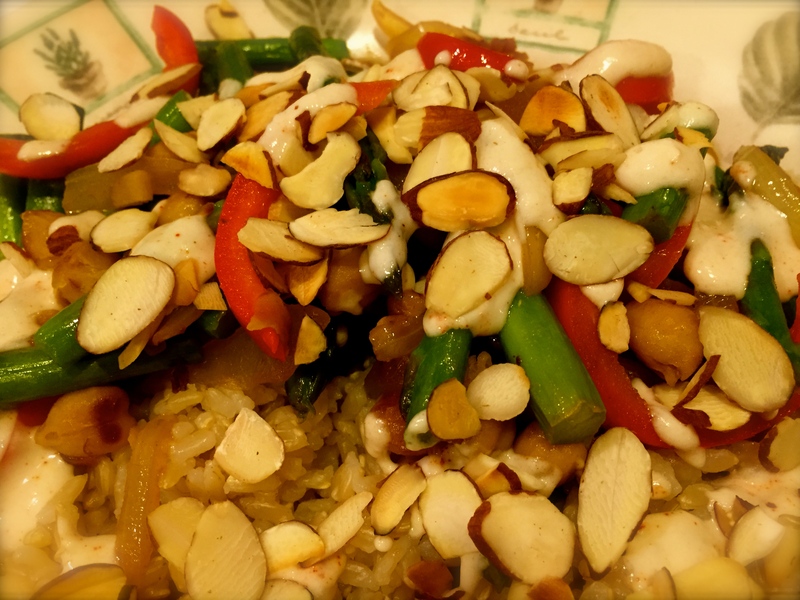 When you taste the combination of the sauté, sauce and crunchy almonds, you’ll know why! It’s divine! Start some rice or quinoa early. Heat a heavy bottomed pan on high heat. Add a little olive oil and swirl it around in the pan. Add the garbanzo beans and sauté on high until they get a little color. Next add the garlic and onion. Sauté until soft and fragrant. Then add the asparagus and bell pepper. Continue to cook for just a few minutes, so the veggies loose the raw taste, but remain crisp and brightly colored. To make the tahini sauce, combine all the sauce ingredients in a food processor and process until smooth. Add only enough hot water to achieve the desired thickness. Taste and adjust salt and lemon if needed. Serve over brown rice, quinoa or any other grain you like. Drizzle with the tahini sauce, sprinkle some toasted almonds over the top and enjoy! It’s very tasty! Thanks for stopping by. I’m a big fan of digging through the refrigerator and then fixing something with what’s there. I just grabbed a bunch of asparagus last night … so maybe this should be dinner? Highly recommend it! I bought another bunch as well, and will make it tonight! I may make this next week! so tasty looking. I just picked up some more asparagus. Fred Meyer had it on sale!